The Jordan River is about fifty miles long. Beginning at Utah Lake, the river flows through the Salt Lake Valley and empties into the Great Salt Lake. Between the 1800s and 1980s, the river was an industrial dumping ground that attracted drug users and other undesirable behavior. As is the case with many urban rivers, Superfund and Brownfield sites exist up and down the banks of the river. In recent history, the Jordan River has been seen by residents, particularly youth, as a place where “you just don’t go.” There hasn’t been much positive activity along the river due to contamination issues and related challenges. Jordan River, Salt Lake County, Utah. Photo: Jordan River Commission. However, in 2008, many Utah organizations came together to develop a long-range plan for the Jordan River that laid out a vision for a revitalized river corridor. The Jordan River Commission was created to spearhead this plan, and it has been successful in building partnerships with organizations now working together to implement this vision. These collaborations have led to a new public appreciation for the river corridor as a recreational amenity and opportunity for conservation, environmental education, and community building. In 2012, several partners in the region were made aware of an opportunity to apply for EPA Urban Waters funding. Excited about the potential to work on water quality issues along the river, they immediately began preparing an application for the urban waters funding. Partners on the grant included Salt Lake County Watershed Planning and Restoration (SLCO), the Jordan River Commission (JRC), and the Center for Documentary Expression and Art (CDEA). Understanding the concerns and interests of community members helped them put together a stronger proposal that was sure to have impact. SLCO was awarded the grant, and in 2013 the partners kicked off a water quality and Jordan River stewardship education program called: ReAwakened Beauty: Place Based Learning on the Jordan River. This project utilized CDEA’s Exhibits that Teach—Artists/Scholars-in-Residence program, which aims to engage high school students and communities adjoining the river in water quality issues directly affecting them. Outreach into schools included study of environmental literature, local issues related to the river, photography, writing, service learning, and restoration efforts. Outreach to communities used public forums that engaged, educated, and empowered residents to co-create projects and educational materials to improve water quality, the viability of the watershed, and their community. Dr. Ty Harrison (far left), CDEA ecologist-in-residence, leads a group of students from the Salt Lake Center for Science Education on a field trip. Photo: CDEA Photographer-in-Residence, Kent Miles. The focus area for the ReAwakened Beauty project was the Rose Park Community. This area was selected because it is an Environmental Justice (EJ) community. The area lacks services, has incomplete access to the river, has a high minority population, and is low income as well as linguistically isolated. The ReAwakened Beauty project consisted of education and development of new technology and engaged students from West High School and the Salt Lake Center for Science Education (SLCSE). Students from West and SLCSE participated in intensive, artists/scholars in-residence programs that took them on field trips to the river (many students had never been to the river), taught them about and engaged them in river restoration and invasive species removal projects, and helped them use photographs, creative writing, and research to develop content for the mobile website, which was the focus of the second part of the ReAwakened Beauty project. CDEA carried out two ReAwakened Beauty—Artists/Scholars-in-Residence programs. The West High School residency was extended from eight to eleven weeks to accommodate the large number of participating 9th graders who were new to environmental education. The SLCSE residency took the expected eight weeks. Both residencies produced a large body of exciting, river focused imagery and related content for use in the Jordan River Commission’s mobile website. Technology came into play in the form an interactive mobile website and smart phone technology. The website served as a dual venue; community members provided and obtained information about the Jordan River (its history, water, ecology, recreation, and community) and the watershed, and also stayed informed about activities along the river. Content for the website was initially developed by students participating in the residency, other members of the Rose Park community, CDEA staff working with community and student participants, Salt Lake County, and the Jordan River Commission. The effort was collaborative and attracted an impressive number of contributors. The Jordan River Commission uploaded the content developed for QR code and smartphone technology. This technology now provides thousands of Salt Lake County residents with easy access to informative and educational material about the Jordan River. The Jordan River Commission was confident community members could access this due to previous outreach efforts that confirmed residents in Rose Park and the broader community had smart phones despite lacking other forms of internet access. Jordan High School students plant Willows and Cottonwood saplings during CDEA residency. A digital map of the Parkway including trailheads, transit connections, water quality data, and parkway features (fishing ponds, restoration areas, dog parks, wildlife viewing areas). A “Report an Issue” feature, which allows trail users to help identify needs for parkway improvement and aid parkway managers with early identification of issues. A series of interpretive stops that contain educational information, photographs, and creative writing about the river corridor including water quality, river habitat, ecology, and wildlife. Information on river restoration and water quality projects, nonpoint pollution, and stormwater pollution. A calendar of upcoming events associated with the river and watershed. Jordan High School students enter Sandy, Utah, restoration site during CDEA residency. Photo: CDEA Photographer-in-Residency, Kent Miles. Though the ReAwakened Beauty project was a two year, grant-funded project, the outcomes are significant. Salt Lake County, the Jordan River Commission, and the Center for Documentary Expression and Art worked collaboratively to achieve a truly impactful education and stewardship program. Youth explored and restored portions of the Jordan River, discovered and communicated their relationship to the river, and provided content for the JRC Mobile Website. In addition, the Rose Park community and greater Salt Lake County as a whole now have access to resources and activities related to the river. The ReAwakened Beauty project went very smoothly. Collaboration among partners was a key to success as was the involvement of residents from the first step thus utilizing a grass-roots or bottom-up approach. Residents were engaged in the actual grant application process; a fantastic example of ensuring equity in the planning process. Special thanks to SLCO, JRC, and CDEA for assisting in the composition of this story. 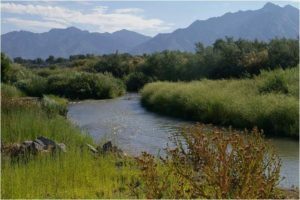 The Salt Lake County Watershed Planning and Restoration Program was created in 1997 and has engaged in numerous restoration, assessment, and planning activities since its inception. The primary goals of the program include assessment and restoration of streams and other water resources in the Jordan River sub-basin, stewardship planning, and environmental education outreach. The Reawakening Beauty project was made possible by EPA Urban Waters funds and through partnerships with the Center for Documentary Expression and Arts and with the Jordan River Commission. Marian Hubbard, Salt Lake County. Cynthia Gonzales, EPA Region 8.